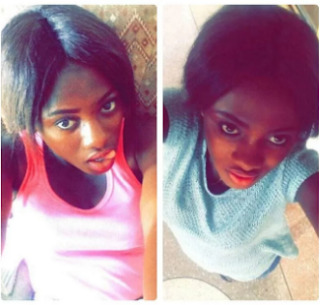 A lady living with HIV virus in Ghana, Naddy Obeng, has vowed to infect more than 400 men before she dies since a man infected her with the disease. 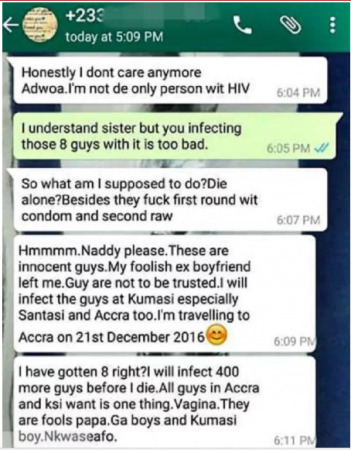 The lady in a WhatsApp chat with one of her friends, alleged that she has infected eight men already and would not die alone as she embarks on a nationwide tour of spreading the disease to randy men because one of them infected her same way. A screen shot of the leaked message shared on social media by the friend with the handle @emmanwandud, shows Obeng boasting that she has successfully gotten eight men and is on a mission to infect at least 400 men before her time is done.